Penny Templeton Studio Has Moved to a Beautiful New Creative Space! After 7 wonderful years at 344 W 38th Street, we feel relieved, blessed and happy to have found the perfect new home for our actors. 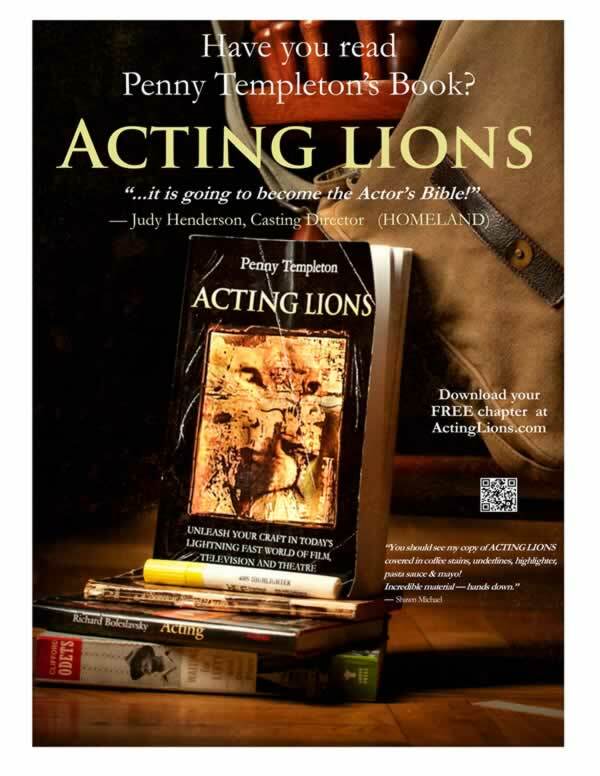 On May 8th, Penny Templeton Studio is taking up residence, just 100 yards east, at Studio 1418, 307 West 38th Street, a bright, fresh and new, creative space to inspire our Acting Lions. In addition, Coaching and Audition taping will now be done in our smaller uptown studio located at 158 West 81 Street. Along with this move we have updated our eqiptment with brand new cameras and state-of-the-art LED lighting. Look for more stories on this move to our new home. Watch Penny Wednesday at 5 on Face Book Live. PENNY TEMPLETON Acting Teacher, Coach, Director, Author; Penny Templeton’s artistry is the culmination of four generations of theatre actresses. Although Penny was warned by her family not to go on the Stage, she embraced her legacy and began performing and studying under such masters as Paul Sorvino and Wynn Handman. Highlights of her career include starring in Joyce Carol Oates’ I Stand Before You Naked at the American Place Theatre, and as Paul Sorvino’s wife in All The King’s Men. She started teaching in the early 1990’s, and opened the Penny Templeton Studio in Manhattan in 1994. Ms. Templeton was selected by Columbia University’s School of the Arts to teach ‘Acting for the Camera’ to third year MFA students. Her book on the craft, business and art of acting, ACTING LIONS has been referred to as “The Actor’s Bible” and is received rave reviews in the industry. Her unique teaching methods and techniques have garnered awareness and recognition from the press as well as industry peers. Most recently the Wall Street Journal highlighted her On-Camera Teaching techniques in its article on the importance of Green Screen in today’s films. She has appeared on ABC News, as well as broadcast media outlets in the US, Great Britain, Canada & Australia as an expert commentator on the craft of Acting. Her articles on acting have been published in national magazines, and she was called upon to be a finalist Judge for the New York Film Festival, Emmys and Cable Ace Awards. Her directorial credits include the Off Broadway show, The Rise of Dorothy Hale, as well as the one man shows: F Train, Idiot’s Guide to Life and I Stand Before You Naked. She is featured in Ronald Rand’s acclaimed Acting Teachers of America, and Glenn Alterman’s book, Promoting Your Acting Career. Ms. Templeton works and Skypes regularly with actors in Theatre, Film and Television in New York City, Los Angeles, throughout the United States, and all over the world. She has recently produced her Facebook Live Stream series on the craft of acting, airing Wednesdays at 5pm EST on the Penny Templeton Studio Facebook page. Penny teaches her Master Class, Advanced on Camera and coaches actor on set, for theater, auditions. and coaches and records self-tape auditions. Teaches Camera Technique, Script Analysis, Beginning Acting Technique and Memorization for Actors and Private Coaching at Penny Templeton Studio. A graduate of the American Academy of Dramatic Arts, Hank immediately began working Off-Broadway in the hit show “Your Own Thing.” His 50 years of theatre experience include Off Broadway. Regional Theatre, and National Tours. He has worked with stars such as Richard Gere in “Awake and Sing.” Jose Ferrer in “Cyrano”, and John Raitt in “Shenandoah“. He was nominated for a Carbonal Award in the Leading Actor category for his portrayal of Billy Flynn in “Chicago.” Mr. Schob has also been featured in the films “Cadillac Man,” “Heading for Broadway” and “Fame.” His TV credits include roles on “All My Children,” “Ryan’s Hope,” ” “Kojak,” and “Law & Order.” He has also appeared on Good Morning America as an expert commentator on Acting and was casting director for the feature film “The Paragon Cortex.” He contributed chapters on Camera Technique, Blocking and Script Analysis to Penny Templeton’s book ACTING LIONS. To receive the Blog, ACTING LION TIPS AND CAREER ADVICE, in your email , SUBSCRIBE to our Newsletter!